Potassium chloride is a white crystalline solid or powder used widely in fertilizers and in the preparation of most potassium compounds. Its chemical formula is KCl, consists of one potassium (K) atom and one chlorine (Cl) atom. An ionic compound is made of a metal element and a nonmetal element. KCl is used as a fertilizer, in medicine, scientific applications, food processing, and used to cause cardiac arrest as the third drug in the “three drug cocktail” for executions by lethal injection. It occurs naturally as the mineral sylvite. 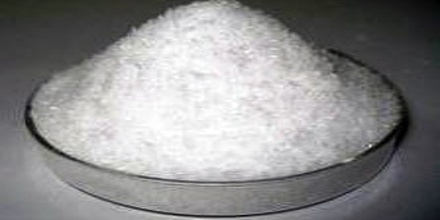 Potassium chloride is a metal halide composed of potassium and chloride. Potassium maintains intracellular tonicity, is required for nerve conduction, cardiac, skeletal and smooth muscle contraction, production of energy, the synthesis of nucleic acids, maintenance of blood pressure and normal renal function. This agent has potential antihypertensive effects and when taken as a nutritional supplement may prevent hypokalemia. 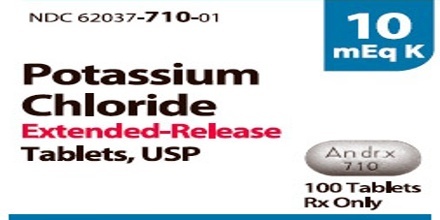 Potassium chloride is used to prevent or to treat low blood levels of potassium (hypokalemia). Potassium levels can be low as a result of a disease or from taking certain medicines, or after a prolonged illness with diarrhea or vomiting. It may also be used for other purposes not listed in this medication guide. In potassium chloride, the metal element is potassium (K) and the nonmetal element is chlorine (Cl), so it can say that KCl is an ionic compound. Most K minerals are harvested from ancient marine deposits deep beneath the Earth’s surface. They are then transported to a processing facility where the ore is crushed and the K salts are separated from the sodium salts. The color of KCl can vary from red to white, depending on the source of the sylvinite ore. The reddish tint comes from trace amounts of iron oxide. There are no agronomic differences between the red and white forms of KCI. 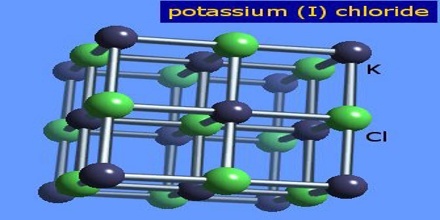 This method is the main method for producing metallic potassium. Potassium chloride has so many uses in different areas even though it tends to go unnoticed by most people. 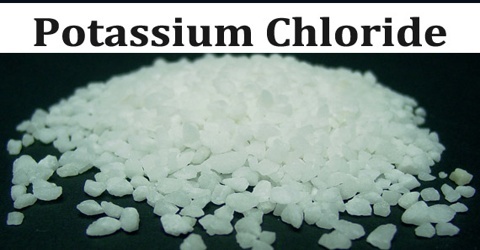 The majority of the potassium chloride produced is used for making fertilizer, since the growth of many plants is limited by their potassium intake. As a chemical feedstock, it is used for the manufacture of potassium hydroxide and potassium metal. It is also used in medicine, lethal injections, scientific applications, food processing, and as a sodium-free substitute for table salt for people concerned about the health effects of sodium. Potassium chloride can be used as a salt substitute for individuals on a restricted salt (sodium chloride) diet. It is used as a deicing agent and has a fertilizing value after the ice melts. It is also used in water softeners to replace calcium in water. Potassium chloride was once used as a fire extinguishing agent, used in portable and wheeled fire extinguishers. Known as Super-K dry chemical, it was more effective than sodium bicarbonate-based dry chemicals and was compatible with protein foam. It has also been used to produce heat packs which employ exothermic chemical reactions, but these have mostly been discontinued with the advent of cheaper and more efficient methods, such as the oxidation of metals (‘Hot Hands’ one-time-use products) or the crystallization of sodium acetate. In larger quantities, however, potassium chloride is toxic. Hyperkalemia can cause muscle weakness, paresthesia of the extremities, listlessness, mental confusion, flaccid paralysis, cold skin, grey pallor, peripheral vascular collapse, fall in blood pressure, paralysis, cardiac arrhythmias, and heart block. It is also used as the third and final drug delivered in the lethal injection process. Reference: drugs.com, dictionary.com, study.com, ipni.net, wikipedia.